I saw what I saw. It was a tough, will-imposing playoff victory on the road against a team that had won 11 in a row. 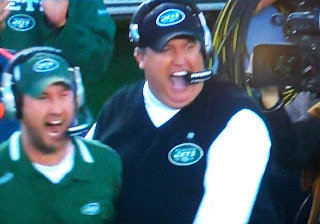 Rex Ryan seemed to know what "Jet Football" meant before the rest of us. I get it now. Run on 1st down, run on 2nd down, don't turn it over on 3rd down, and let the D do the rest. 17-14 is the way he drew it up. The formula for momentum may be mass times acceleration, but momentum is built on moments. A few game-changing statements when Jets fans knew things were a little bit different this time. There was the 2nd quarter effort where Jet Safety Jim Leonhard lost his helmet but came up with the football after he separated Malcolm Floyd from it. 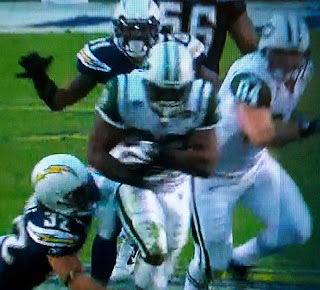 The fact that the play was called incomplete (in a dubious overturn) wasn't the point. The smallest man on the field was a guided missile all night. 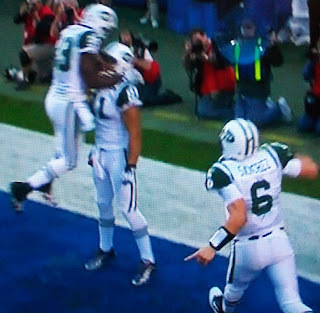 When the Jets trailed 7-3 early in the 4th, Mark Sanchez rolled right on a 3rd & Goal on the 2. When nobody was open I shouted "Throw it away!" But Rookie QB bought time and space with his feet, and sure enough found 2nd Year TE Dustin Keller in the back of the end zone. For a guy who threw for only 100 yards, these 2 yards were awfully big. And for Kerry Rhodes with the massive sack and strip on Philip Rivers, there was a little redemption there. 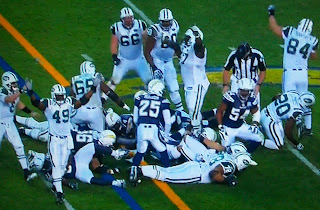 Rhodes was probably the best player on the Jets last playoff team in '06, but was maligned much of his first year in Rex's D.
And there was another rookie, RB Shonn Greene, two hands on the football, running over Eric Weddle and charging 53 yards to the Chargers' end zone. And if you take away all the intangibles that propelled this postseason ride, this runner is the #1 reason the Jets can beat anybody on any field. But on the huge 4th & 1, to put the game away, it was Jet vet Thomas Jones who powered over the right side. It was the right move in a meeting of the minds of the OC and HC (who also happens to be the DC). The fact that Brian Schottenheimer can buy into Rex Ryan's old-school vision is symbolic of the total team effort. That's something we can all buy into.